Attention received for the additional request for my room. Big, comfortable and very well equipped room, they even have a universal power outlet adapter. Super calm area, and the rooms have a great acoustic isolation. Great option if you want simple yet comfortable accommodation. Everything you need for your stay is provided. 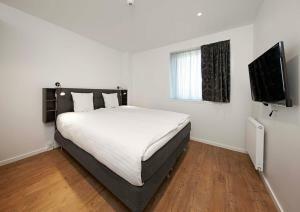 Within easy walking distance to shopping centre. Very friendly and helpful staff. Directly on main route to centre of Copenhagen (ca. 30 mins by car). the supermarket was very close. the loxatipn was great.near to bus stop. The front staff was very helpful. We liked that the market and the bus stop were across the street. The apartment was clean and comfortable and quiet. We enjoyed our stay. The rooms were new, modern and very clean, location practical close to highway and supermarkets. Modern and very good for families who would like to cook their own meals. Very clean, good wifi. Also good for business visitors. Close to supermarket and other amenities. Train station is a 5 min walk. Lock in a great price for Living Suites - rated 8.4 by recent guests. Living Suites offers self-catering apartments in Nærum. Copenhagen is 9.9 miles away. Free WiFi is available. All units feature a balcony and flat-screen TV. There is also a kitchen, equipped with a fridge. Some units include a dining area. There is a private bathroom with a shower and free toiletries in every unit. Towels and bed linen are featured. Private parking is available on site. Bike hire is available and a fitness centre is located right across the street. Malmö is 23.6 miles from Living Suites. The nearest airport is Copenhagen Kastrup Airport, 13.7 miles from Living Suites. This property also has one of the best-rated locations in Nærum! Guests are happier about it compared to other properties in the area. This property is also rated for the best value in Nærum! Guests are getting more for their money when compared to other properties in this city. Living Suites has been welcoming Booking.com guests since 9 Jun 2016. When would you like to stay at Living Suites? 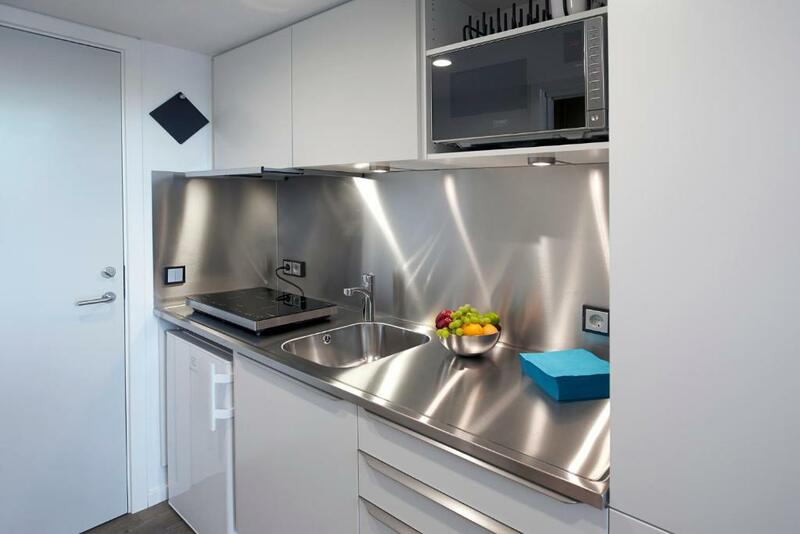 Comprised of 2 interconnected studio units, this studio apartment features 2 kitchen units, Apple TV and 2 bathrooms. There are 2 sleeping lofts that accommodate 4 persons and can only be accessed via a ladder. The other 4 persons are accommodated on the fold-out wall beds. 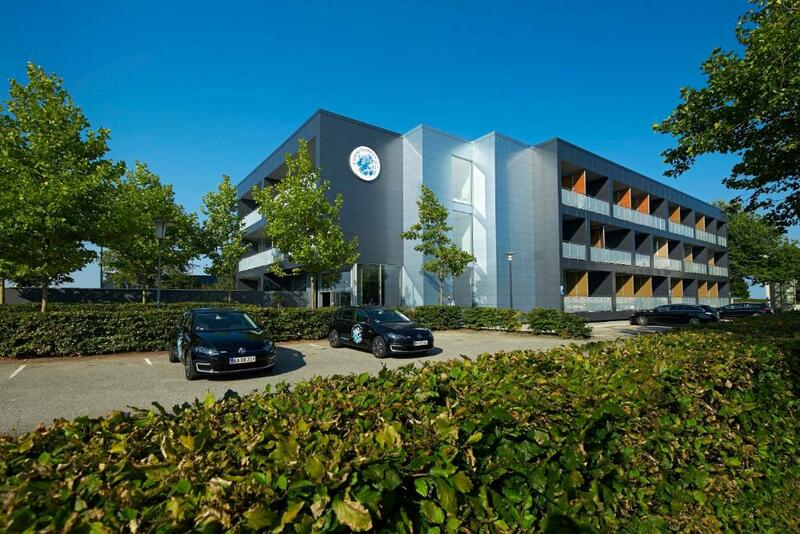 Private parking is possible on site (reservation is needed) and costs DKK 75 per day. Featuring a west-facing balcony, this apartment also has a modern bathroom with walk-in shower and high-quality toiletries. A Nespresso coffee machine, and convection oven are provided in the kitchen. There is a fold-out wall bed in the living room. Featuring a balcony, this 2-bedroom apartment has a dining table and Nepresso coffee machine. The modern bathroom has a walk-in shower and high-quality toiletries.. Please note that 2 persons are accommodated in a sleeping loft which is only accessible by a ladder. 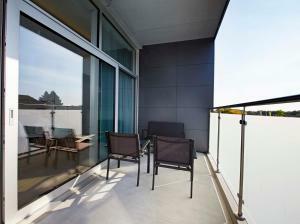 Featuring a balcony, this studio also has a fully equipped kitchen and flatscreen TV with Apple TV service. The bathroom features a walk-in rainfall shower. This studio features a modern bathroom, Apple TV service and a furnished balcony. Two persons are accommodated in the sleeping loft and it is only accessible by a staircase. 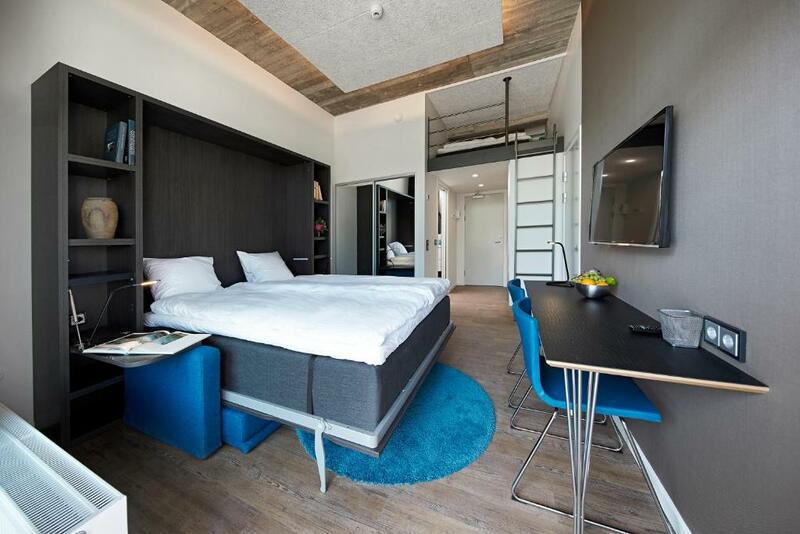 The other 2 persons can be accommodated on the fold-out wall bed. 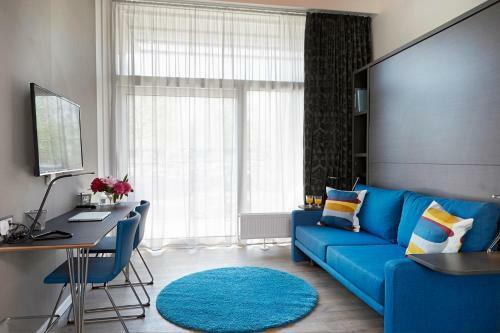 Living Suites is a brand-new apartment hotel that offers a high degree of homely comfort. The hotel is located in Nærum, Copenhagen North. All apartments feature fully-equipped kitchens, sofa settings, large balconies as well as superior quality beds. The interior resembles Scandinavian design to create a feeling that combines functionality, aesthetics and comfort. 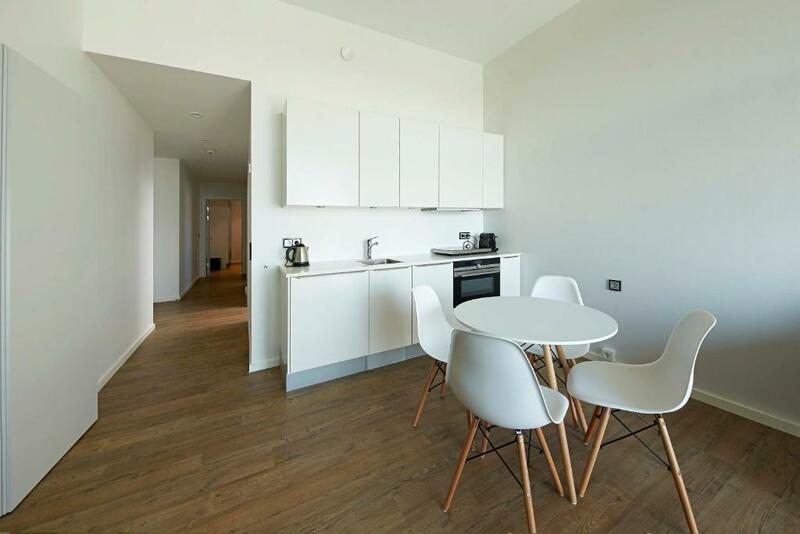 Moreover, the apartments offer ultra-fast WiFi, flat screen with the Apple TV-box and an easy to use self-controlled heating system. 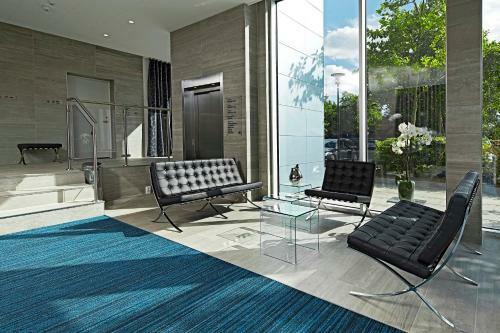 Living Suites' onsite facilities include a guest laundry, a social lounge area, large common kitchen facilities, two meeting rooms and easy parking. House rules Living Suites takes special requests - add in the next step! All children under 2 years are charged DKK 100 per night for children's cots/cribs. Living Suites accepts these cards and reserves the right to temporarily hold an amount prior to arrival. Not having available double blankets for a double bed. There was only one disadvantage for me: too soft pillows and mattress..
Everything was excellent! Very detailed instructions for self check-in beforehand. Very convenient access into the hotel and room. Comfortable, modern and laconic design, full equipped apartment with mini kitchen. You have all you need for week staying and self service. (Iron and vacuum cleaner you can find on every floor). Free parking. Extra large kitchen in the basement. Market square is opposite hotel. Very close to Copenhagen and other places of interest by the car. We needed an adapted room but it was no longer available. I think it would be a good idea to add some holding bars in the bathroom near the shower and the toilet. Would be much easier for elderly or handicapt people even if it wad not fully adapted. The living room is not really cozy. No one sits in the chellar for fun. Better to adapt the foyer . Was exactly what we needed. Reasaonnablw price. We did not use most of the facilities as the kitchen but everything is in perfect condition and supermarkt near by. A bit confused about parking charges. There is ample parking at the front and secured parking (via key fob) at the rear. I added parking without the real need to. Bearing in mind this was in December (out of season); other times may be different. Other than that, the only thing we missed were dishwasher tablets (no point buying a bag of 30, unless you take the rest home!). Really great for work travel with the equipped kitchen. In general the idea of apartment-hotel rooms was nice. Anyway, there was no room service (cleaning) in 5 days, and for that money, traditional hotels nearby would include breakfast and cleaning room daily. Excellent choice. Big room. Big patio/balcony. Free easy parking and free fast WiFi - a bargain! Also free passes to huge fitness center across street.